Added a couple pics sent by Stephen B and another of the Ike Oval Office pics. After John in NOLA sent scans of a Jan 1961 Nat’l Geographic article with well-preserved images, I was able to re-color-correct the Ike-era photos (and one Kennedy-era photo) to more accurately reflect the original colors. The gray-green walls and blue-green carpet are very tricky to get right—especially with source images that are in varying stages of fading and deterioration. 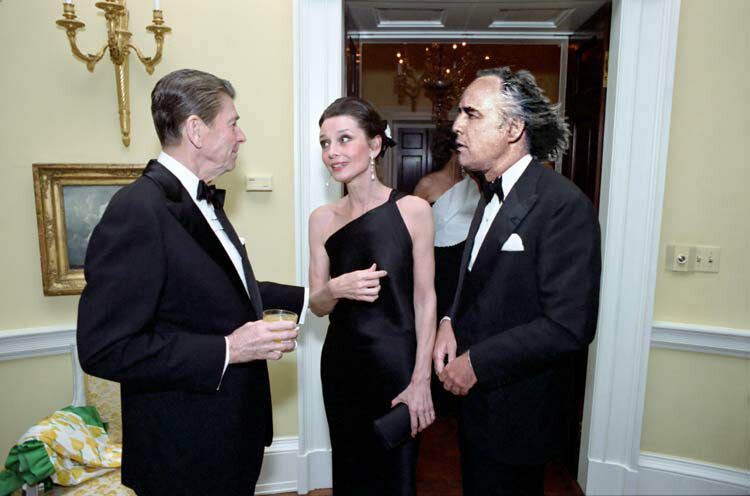 UPDATE: Rare photo of President Marlon Brando and First Lady Audrey Hepburn-Brando welcoming former Governor Ronald Reagan to the White House in the Yellow Oval Room in 1981. The WaPo also mentioned us, in regard to the movies and TV page. And the AP references the Queen’s Bedroom page. Stephen B sent this scan of an etching of the East Room that looks to him and to me to be pre-Lincoln. I’m not sure of where it came from (original had a frame that made it look like probably a postcard) and Stephen didn’t give a hint as to its origin or age. Any takers? I’ve tentatively added it to the page (with a circa 1858 date) for easy comparison. Thanks Andy! I’ll get right to work on these. The WHM has been light on Ike all along. UPDATE: Stuck in ORD for three hours, I added 16 Ike-era images, which nicely filled in holes on a dozen pages. Check out the porthole TV in the West Sitting Hall! Andy’s link to the Kennedy before-and-after photos. These are already included in the WHM. Added several more historical photos forwarded by Pete. Thanks, Pete! Also, I saw The Simpsons Movie and posted my review of its depiction of the White House, which didn’t change from seeing it in the trailer. PS— I still don’t have a review of Commander in Chief. Didn’t anyone watch that show? 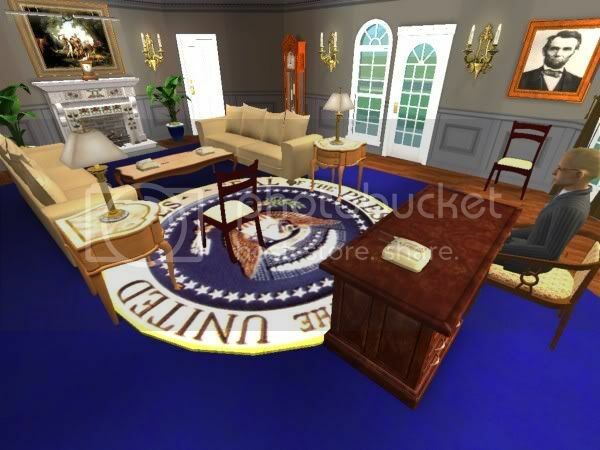 Someone called Henny X has produced a virtual White House for Sim games. I don’t know a lot about the Sim universe, but I can see that a lot of work went into creating the replica, but not a lot of research….